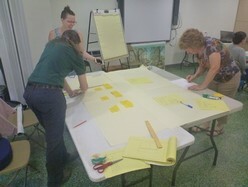 Interpretive Writing for Museum Exhibits and Outdoor Interpretive Panels (hosted by the Cranbrook House). One day workshop for MMA members. 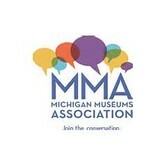 Workshop details can be found here: http://michiganmuseums.org/event-2211103. June, 2016. Barcelona University, Spain. Provide a cyper-class by skype, for a post degree course in Ecotourism and interpretation in Nature guiding for Barcelona University. Two hours open lecture related to Interpretation and Nature guiding. April, 2016. Kaser Design/Bachman Lake Trail Interpretive Panels Text Development. Jan/2016. Klaipeda State College, Lithuania. John Veverkaa/Heritage Interpretation Training Center was invited to participate in a partnership between our organizations, in lecturing at Klaipeda State University of Applied Sciences, Lithuania. Our department delivers Tourism administration, Wellness service management and Sport and leisure management study programs. On the basis of the academic contact we have had, and having in mind your academic highlights, we would appreciate having you as a guest professor for lecturing in November 2016. Final dates will be confirmed a few weeks. For more information you are invited to visit the Universities web site at: http://studyinlithuania.lt/en/institutions/klaipedastatecollege. Allegheny County Parks, PA - 3-day interpretive training workshop for new and seasonal interpretive staff on Interpretation and Interpretive Program Development, Boyce Park in Allegheny County Pennsylvania. May 17th to Thursday May 19th at Boyce Park. 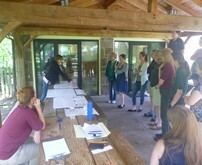 Toronto Zoo (Canada) - John Veverka/Heritage Interpretation Training Center - Develop and present a training seminar and practicum workshop for the Toronto Zoo Education Staff on Interpretive Writing, with a practicum activity of having staff develop some draft interpretive panels. December, 2015. Snowdonia National Park Training Center, Wales, UK. John Veverka/Heritage Interpretation Training Center will be providing a training course on Interpretive Master Planning, April 26-29, 2016, Plas tan y Bwlch, Wales. http://www.eryri-npa.gov.uk/study-centre. 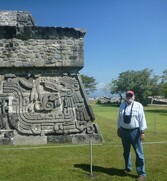 John Veverka/The Heritage Interpretation Training Center is pleased to announce that he will be partnering with Dr. Ted Cable of Kansas State University to offer our Interpretive Master Planning Course through KSU's Global University program (A Campus without Boundaries) for three (3) Semester Hours of college credit. The Interpretive Master Planning Course will appear in the KSU's Spring 2016 Catalog. For more details on future registration information for our 2016 course please contact Dr. Ted Cable at: tcable@ksu.edu. You can visit the Global Campus web site at: http://global.k-state.edu/. Exhibit Professionals Group Workshop, Michigan. John Veverka/Heritage Interpretation Training Center, will be presenting a one-day workshop on "Planning Truly Interpretive Exhibits", to be held at the Arab American National Museum, Dearborn, Michigan - October 23rd, 2015. Museum Study - is an organization whose mission is to help staff in small to medium museums and heritage sites build a better cultural institution and be a stronger member of the team that carries out the mission of their institution. To accomplish this, Museum Study provides online professional development training courses on a broad range of topics important to running a cultural institution. JVA/Heritage Interpretation Training Center is pleased to be working with Museum Study to offer several 4-week long training courses in Heritage Interpretation, the first course being "An Introduction To Heritage Interpretation" that will be presented in November, 2015. 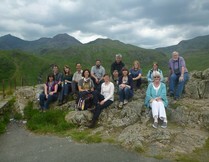 You can learn more about Museum Studies diverity of Museum Management and Curation courses at their web site: http://www.museumstudy.com/. JVA interpretive courses planned for 2016 include "Interpretive Writing" and "Planning Truly Interpretive Exhibits". 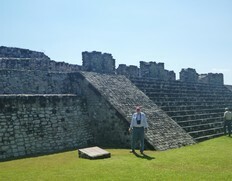 Details on the Introduction to Heritage Interpretation course and other courses: http://www.museumstudy.com/courses/course-list/. Lower Colorado River Authority/Matt Kaser Design - Matagorda Bay Nature Park Interpretive Plan and Exhibit Concept Design Services. JVA was pleased to join with our long-time interpritive design partner Kaser Design (http://www.kaserdesign.com/) in providing interpretive planning services for the Matagorda Bay Nature Park, in Texas. 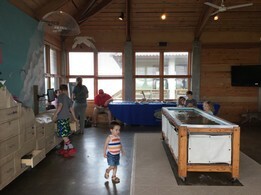 You can learn more about the Nature Park here: http://www.lcra.org/parks/developed-parks/Pages/matagorda-bay-nature-park.aspx. This first project phase was completed 15 June 2015. 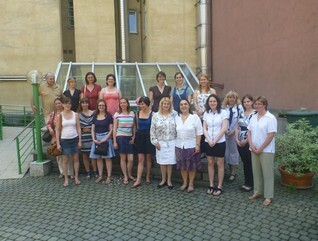 Association of Cultral Heritage Managers - Budapest, Hungary. John Veverka presented a workshop on developing visitor survey research/questionnaires for the Association of Cultural Heritage Managers - Buddapest, Hungary, to develop market/visitor research for the Budapest World Heritage Site. The workshop included discussions on visitor research practices, developing survey research plans and related visitor research studies and had course paritcipants actually conduct a pre-test visitor survey program. 13-15 June 2015. 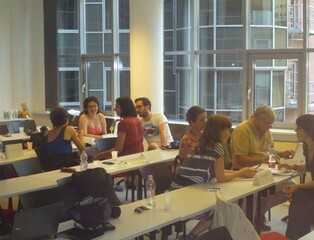 John's participation was funded by a grant from the US Embasy in Budapest, Hungary. 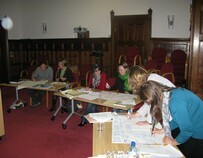 Workshop participants (left) - and some team members developing their visitor survey instruments. Workshop participants working on mock-up exhibits (left and center) and presenting their exhibit deisgns and strategies to other course participant teams (right). Lithuanian National mission for UNESCO/National Focal Point for Cultural Heritage - Two day conference on Capacity Building Training in Communication and Management of Trans-boundary Properties. John Veverka was invited as a presenter for this conference for training on the role of interpretation in communicating and managing the trans-boundary World Heritage Sites in the Baltic Sea region and to increase public awareness, involvement and support for the World Heritage. 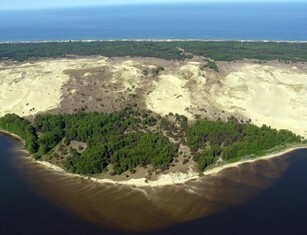 A lead partner was "Kursiu Nerija" (Curonian Spit) National Park and World Heritage Site (managed by both Lithuania & the Russian Federation) - http://www.nerija.lt/en. 28-29 September 2015. 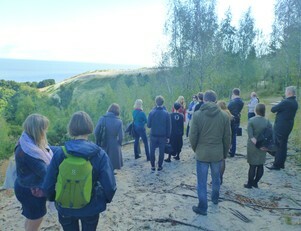 One of the dramatic sand dunes that makes up the 50 miles of the Curonian Spit (left) and JV with other seminar participants on the top of one of the larger dunes (right). October 25, 2014, State of Morelos, Mexico. Full interpretive master planning is scheduled for late 2015. CH2MHILL National Park Service IDQ. JVA is a team member with CH2MHILL in their recent award of an Indefinate Quanties Contact Award with the NPS. JVA will provide interpretive planning/design services as needed over the 5 year IDQ award period. US Army Corps of Engineers. JVA was awarded a contract to totally re-vamp the interpretation course - Interpretation for Supervisors, Managers and Team Leaders, for the 2015 training seasons. 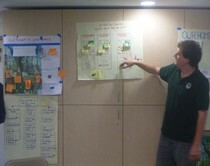 This included a new schedule of instruction for the 4 1/2 day course and a new course manual. January 2015. US Army Corps of Engineers, Interpretive Services Course, Huntsville, Alabama. This is year 4 into our 5-year contract for developing and teaching the 4-day interpretation courses on basic interpretive services. Training focuses on interpretive theory and principles, planninng interpretive media, planning, presentation of an interpretive program, and field experience in interpretive planning at theWheeler NationalWildlife Refuge. The course is taught twice each year. 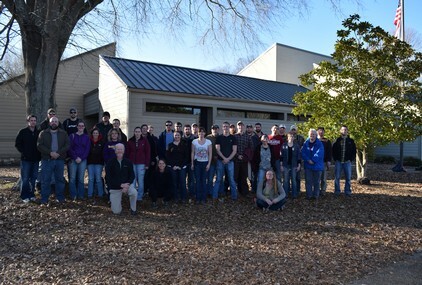 The first 2015 course was the week of 26 January, 2015 (class photo below). Snowdonia National Park Training Center, Wales, UK. We have scheduled our 2015 courses (Interpretive Master Planning in March and a new course TBD October) - watch this web site or contact us for details. You can visit Plan Tan y Bwlch training center in Wales - UK at: http://www.eryri-npa.gov.uk/study-centre. Look under Professional Courses. Korea National Arboretum. JVA, working with Dr. Ju-Hee Lee of Daegu University (Korea), began working on a new project for the Korean National Arboretum in 2012, developing an interpretive training program/exhibit planning training program, for Arboretum Staff. I will be working on a strategy for training people who want to be an expert on Interpretive Education and Exhibit Planning in Arboretum settings for the first phase. Current work includes developing the full curricula for the training program as well as lesson plans, teaching aides and related materials, all of which will be translated into Korean. I just finished my new book "An Interpretive Trainers Handbook" which will be incorporated into the training program. The project was completed in 2015.